Quite a mammoth week in the curtain and cushion making world. Bessie is certainly beginning to look very pretty indeed. All of the window curtains are now made and most of them in place, just a curtain to make in front of the cupboards and a pelmet to the front window. There are half a dozen Cath Kidston, Laura Ashley and Clarke and Clarke cushions all looking very welcoming – I have to admit to a quiet reading afternoon with a little white wine spritzer in the hot sunshine! On now with bunting and more bunting – how pretty will Bessie be? 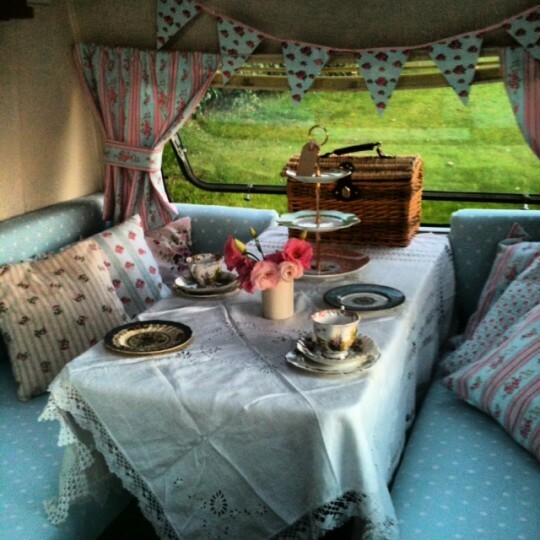 I think Bessie needs an outing this week…….